Cross-Country Skiing: Whistler's Other Skiing! Cross-Country Skiing: Whistler’s Other Skiing! When you think of skiing in Whistler, you probably picture someone sliding down the slopes of Whistler or Blackcomb Mountain. But there’s a whole different type of skiing that’s well worth trying in Whistler: that would be cross-country skiing. Cross-country skiing, or Nordic skiing, is one of those sports that’s a ton of fun whether it’s your first time trying or you’re a seasoned pro. If you’ve ever downhill skied before, you’re ahead of the curve already. If not, no worries – though you might feel a bit awkward at first, most people pick the sport up pretty easily. The first step to cross-country skiing is to pick up some gear. There are a few rental options in Whistler (check out the shops in PassivHaus by Lost Lake and at the Whistler Olympic Park in Callaghan), or if you’re planning on making the sport a new hobby, you can invest in a pair. Cross-country skis (and the corresponding boots, bindings, and poles) are different from downhill skis – don’t set off to Nordic ski on your pow skis! 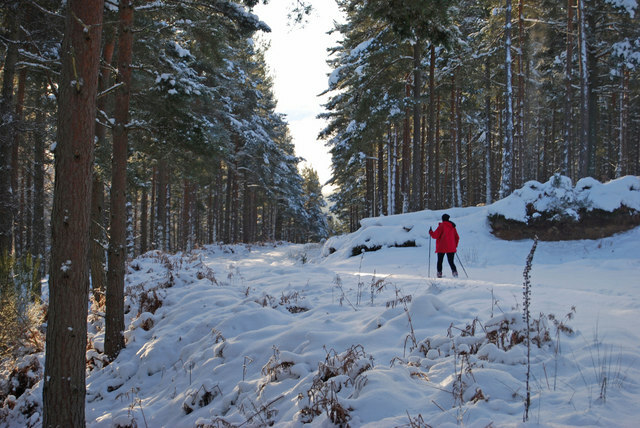 In fact, there are two different styles of Nordic skiing: classic and skate. Both are a lot of fun, and the only way to figure out which you prefer is to give them each a try! Staying warm isn’t difficult: cross-country skiing is a total cardio workout, and if you’re putting some effort into, you’ll work up a sweat in no time. As such, you generally don’t need to dress as warmly as you would for downhill skiing. Layers are your friend – you can peel them off as you warm up. We already mentioned two popular places for cross-country skiing in Whistler: Lost Lake and the Whistler Olympic Park. Lost Lake is conveniently located walking distance from the Village. The main loop around the lake is relatively flat – it’s a great option for beginners. There are plenty of trails to explore around the main loop, catering to skiers of all levels. The Whistler Olympic Park is a little further out of the way, but you’ll be rewarded for your efforts. Head down the Sea-to-Sky Highway and you’ll see the sign just south of town in the Callaghan Valley. Wind your way up the side roads until you hit the park. It’s a cross-country skiers paradise: there are countless trails to explore and you can ski the same laps that Olympians skied back in 2010. Whistler Olympic Park stays open until 9, and several trails light up at night – it’s a beautiful sight to behold. Both Lost Lake and the Whistler Olympic Park are professionally groomed and maintained, so you have to purchase a ticket to access these areas. However, there are a few free cross-country ski areas around Whistler – the Valley Trail from Meadow Park to Rainbow Park is one such example. Once you’ve been bitten by the cross-country ski bug, you’ll want to get to know the Whistler Nordics Ski Club, a local organization for Nordic skiing enthusiasts – visit the website for more details.